lab as part of the Illinois Cancer Scholars Program. When Pierce Hadley came to the University of Illinois, he wanted access to professors, a chance to do research in a lab, and a perspective on how his classes and research in bioengineering could relate to medicine. He found all of that when he became one of 12 students who are the first cohort of the Illinois Cancer Scholars Program, a new undergraduate training program launched in fall 2014 in the department of bioengineering. The idea behind the program is to offer students a different kind of educational experience in which they learn about a real-world problem and approaches to solving it. The goal is to show the students the relevance of their coursework and to provide clinical and research opportunities for them to apply what they are learning to cancer research. “When you’re surrounded by all these people doing great work and you participate, it makes you want to keep learning and keep expanding your knowledge so you can do more,” said Miranda Dawson, who started in the Illinois Cancer Scholars Program last year with Hadley and is now a sophomore. 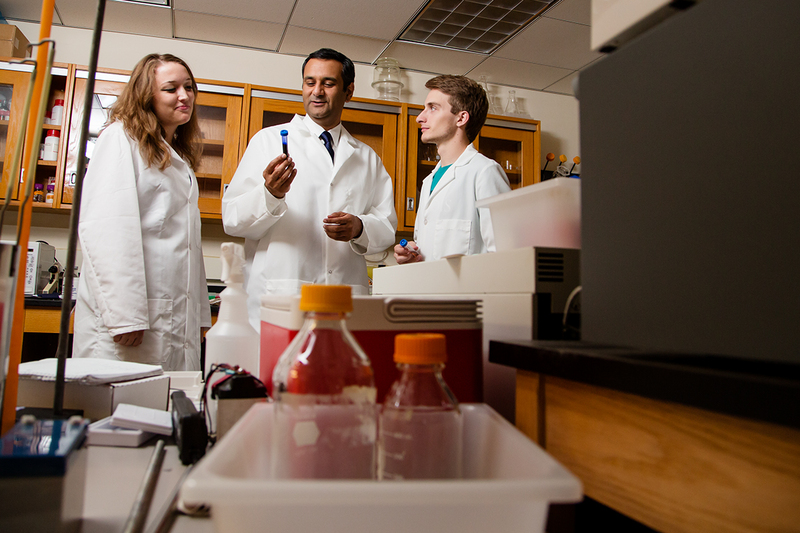 That’s the kind of motivation that bioengineering professor Rohit Bhargava was hoping students would gain when he developed the Illinois Cancer Scholars Program. “It’s going to transform their education. This is different. This is not your parents’ Illinois education – it’s the future,” said Bhargava, who oversees the program along with faculty members Marcia Pool, Dipanjan Pan and Andrew Smith from bioengineering and Scott Carney from electrical and computer engineering. The Illinois Cancer Scholars Program emphasizes beginning research early and building the skills for students to use their education to address a real-world problem. As freshmen, the students in the program take a science-oriented course that analyzes particular problems related to cancer research and the current methods of addressing those issues. They also find a research adviser on campus and begin doing research in a lab. Dawson is using infrared spectroscopy to look at how the structures of cells change as breast cancer progresses, while Hadley is starting research on self-seeding of tumors, looking at how cancer cells circulate between a primary and secondary tumor and how that affects tumor growth. The summer following their freshman year, the students participate in research as well as a weeklong research boot camp. The sophomore class on health care innovation covers topics such as ethics, intellectual property issues, Food and Drug Administration regulations, and entrepreneurship. The summer after students’ sophomore year, they are expected to gain clinical experience working as an intern in a hospital or industry setting. They’ll take an electrical engineering course taught by Carney during their junior year to learn about project design in preparation for their senior design projects. At graduation, “they’ll be equipped to go out and have an impact,” he said. Bhargava recalled the time it took for him to understand the relevance of the engineering courses he was taking at the prestigious Indian Institute of Technology in New Delhi. She believes it fosters a more mature scientific understanding. And, she added, the program also helps students learn whether research is for them. “Fortunately, I like it,” Dawson said. Likewise, Hadley said what he’s learned so far in the program has helped put his education into perspective and increased his understanding of what he’s learning. The freshman class “taught us how to ask questions,” he said, and the innovation class he’s now taking as a sophomore is helping him think about who his research might help and how it could help them – something he believes will improve the project. The students were chosen based on intellectual merit and on their intent to work in the health arena. “We looked for people who wanted to have an impact, more than people who were interested in cancer,” Bhargava said. A second group of 13 students was admitted this fall. Bioengineering majors comprised the first group but in its second year, the program has expanded to include students in electrical engineering, computer science, and industrial and enterprise systems engineering. Bhargava said the goal of using engineering research and technology to address medical problems is very compatible with the new Carle Illinois College of Medicine being established on the Urbana-Champaign campus. The Illinois Cancer Scholars Program was started with grant funding from the College of Engineering’s Strategic Instructional Initiative Program. Bhargava hopes to expand the program to other areas of campus, such as the life sciences, applied health sciences and social work. And he would like to see the topics expand to include energy issues and agricultural sciences. Bhargava would like to find alumni who can serve as mentors to the students in the program and who could help sponsor scholarships to help with expenses when the students are doing research in this area instead of more lucrative internships. The students in the program “are very passionate about what they are doing because they can understand how their education is intertwined with research,” Bhargava said.